In our recent travel poll, Food & Wine’s readers named Charleston the most exciting up-and-coming restaurant city. We couldn’t agree more. 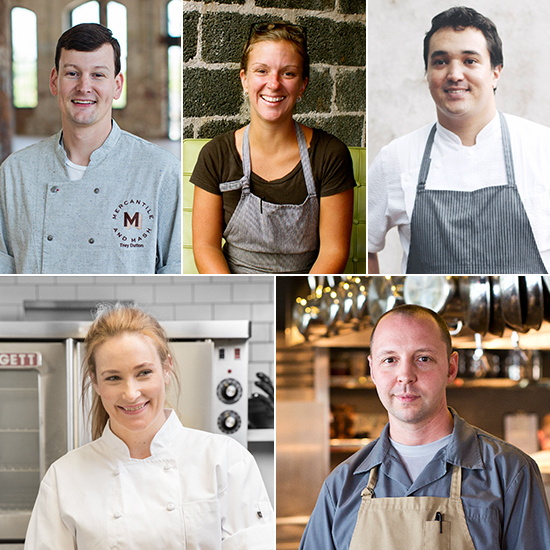 Here, five rising star chefs on our radar. The mastermind behind the menus at the city’s first food hall, an Eataly-esque experience opening soon, describes the project as having “everything outside of a traditional restaurant”: a coffee bar serving locally roasted Black Tap coffee, a fresh produce market, grab-and-go morning breakfast, a meet and cheese case, fresh pasta, an upscale dive bar called Mash. That's all in addition to the restaurant itself, Mercantile. After hours, Dutton will teach classes in canning—his side business, Southern Keep, focuses on pickles, jams and chowchow—as well as sausage making and baking. 701 E. Bay St.; mercandmash.com. The soda-shop reviver creating the menus for what will be one of the city’s most fun new openings (debuting any moment now), Hahn tops hot dogs with dill aioli and shrimp salad; her waffles come with craveable combinations like chai soy caramel and banana, or sesame and miso butterscotch and smoked walnuts. Childhood trips to see her grandmother on Long Island, New York, inspired the nostalgic atmosphere of the shop. “The highlight of my visits to Malverne, New York, were when my grandmother Ruth took me to get a grilled cheese and a chocolate malted milkshake,” says Hahn. “It’s an experience I hold very dear in my heart, and there isn’t anything like that in Charleston yet.” 207A St. Philip St.; parlordeluxe.com. The vegetable devotee is famous for his complex, nine-ingredient salads at this neighborhood institution, founded by local legend Mike Lata. Stanhope describes the intricate process of creating his signature salads: “Every morning, my sous chef and I pull nine of our favorite vegetables out of the walk-in and figure out how to treat each one—roasted, pickled, braised, poached, raw, charred, pureed. We put them all on one cutting board together and decide how they’re going to play nicely in one bowl.” Now in its 12th year, the restaurant is still going strong. “We continue to carry that torch of timeless fine-dining cuisine and laid-back, unpretentious atmosphere,” says Stanhope. “We stick to our guns.” 232 Meeting St.; eatatfig.com. The heirloom grain geek behind this new restaurant grinds local rye for impeccable pastas like burnt rye tonnarelli with cured egg yolk and smoked olive oil. Whiting's goal is to create complex dishes that are still very approachable to the guest. “There’s a lot of layers to our cooking,” he says, “but we feel we’re here to please our guests, not educate them. The last thing I want is for anyone to feel intimidated.” He sees himself as a part of a greater community of restaurants in Charleston and wants his patrons to feel free to explore. “Our menu is meant to be conducive to visiting all the other great restaurants around us, too. You can totally come in and have two great plates and move on, or you can spend the evening with us. We’re set up for both.” 492 King St.; 492king.com. Classically trained in Italy, this seafood-obsessed up-and-comer has brought her signature cioppino—a nod to her San Francisco upbringing—to the East Coast, where she’s serving a menu driven by the local waters and her love for seaside Mediterranean cuisine. Inspired by one of the co-owners, a florist, she also loves to incorporate edible flowers into her cooking. “I’m very herbaceous with my food,” she says, “and this whole concept is very fresh and beautiful and clean.” Though she’s been in Charleston less than a year, she’s already enamored with the restaurant community. “Everyone is really welcoming, yet everyone works really hard. I think I’m here for a while.” 103 Spring St.; cannongreencharleston.com.